5-Book Series Bonjour Never Land - Bonjour Never Land Bonjour Never Land, a 5-book Series,Bonjour Never Land | Sophie and Pierre through a series of adventures unveil a corner of the secret life of the rich and famous. BONJOUR NEVER LAND accounts for the unusual story of the scoundrels Sophie and Pierre cooking for the RICH and FAMOUS. 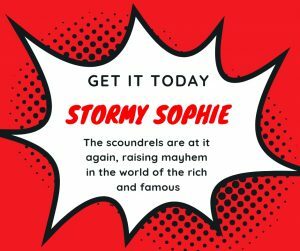 If you enjoyed The “Devil Wears Sprada,” you’ll love “Stormy Sophie.“ Sophie hot temper and Pierre complacency for a well supplied wine cellar, will lead the two scoundrels in a series of bizarre, hilarious and even suspenseful adventures. In a world they knew too well before they lost their respective fortune. “Stormy Sophie“ is the first novella of the series now available for your pleasure on Amazon. The sequel: “Money Galore” is due for publication April 2019. Subscribe to Stella’s Easy Recipes to be kept aware of all our publications including the “Cook Book of the Filthy Rich.” The scoundrels live the strangest of the strangest adventures which is accounted through out our 5-Book Series.